Inspired by law enforcement, the Sightmark Mini M-Spec LQD DE (SM26043-LQD) is an ideal optic for hunting, competition shooting and home defense. The Mini M-Spec is built from aluminum alloy with a steel protective shield making it one of the toughest compact optics out there. With 10 brightness settings, the Mini M-Spec reticle is visible in virtually any environment, from day time to extreme low light conditions. Mini M-Spec users benefit from the addition of ambidextrous switch controls to fit the needs of both left- and right-handed users. Mini M-Specs boast a coated and scratch resistant lens, 12-hour auto shut-off and is IP67 rated waterproof, dustproof and shockproof. 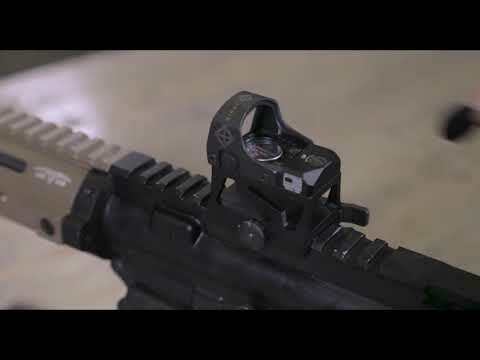 The optic comes complete with a locking quick-detach mount and AR riser mount perfect for ARs, AKs, shotguns and pistols.